This article is about an upcoming work. Editors must cite sources for all contributions to this article. Edits that do not follow this standard will be reverted without notice. For more information, see the Citation Policy. 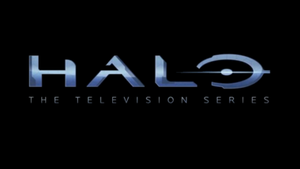 Announcement logo for Halo: The Television Series. Halo: The Television Series is an upcoming live-action television series for Showtime, set to air in 2020. The series will be available to users with the Halo Channel application for Xbox One and Windows 8.1. It will be distributed globally by CBS Studios International. Other streaming services that will air the show include Stan. The series will have 9 episodes and is set during the Human-Covenant War. John-117 will be one of the lead characters of the series. Multiple planets will feature. Announced in 2013, the show was in in development hell for five years. By April of 2014, it was reported as "still in the deal-making phase as the service has been going through the growing pains of establishing a business template for original content." The series was stated to have connections with Halo 5: Guardians and Ridley Scott's Halo: Nightfall during this time. Originally set for release in Fall 2015, at roughly the same time as Halo 5: Guardians, the show was delayed. It will start filming in Fall 2018. Originally, acclaimed filmmaker Steven Spielberg had been confirmed as the show's executive producer. Microsoft's president of entertainment and digital media, Nancy Tellem, said they will take the time necessary to produce the shows and Microsoft Studios corporate vice president Phil Spencer said the show will not be 'filler'. According to Latino Review, Neill Blomkamp, originally slated to direct the Halo film, is apparently set to direct the series. Latino Review reports that it heard the news from "trusted sources". The series was originally set to air in 2019, but has been pushed back to 2020. Kyle Killen is the executive producer, showrunner, and writer of the series. Rupert Wyatt was announced direct multiple episodes and also serve as executive producer. The writers will work with the 343 story team as to keep the show within the Halo canon. In December 2018, Wyatt left the project. In February 2019, it was announced that Otto Bathurst had been chosen as the series's director and executive producer. On April 17 2019, Pablo Schreiber was unveiled to be the actor playing John-117. Yerin Ha, was cast as Quan Ah a new character. ↑ OXM: Halo is our 'most important IP', says Microsoft - TV show won't be "filler"